Current Status: in Grand Lodge Vault; merged into Golden Rule Lodge, 05/27/2005. The Lodge of Stirling, Malden, Massachusetts, has since 1914 used an emblem unique and distinctive, showing in addition to the Square and Compasses a Red Cross of St. Andrew and a Scotch thistle. The lodge was instituted on November 30th, the feast day of Saint Andrew, the patron saint of Scotland, and his cross is used as the foundation of our emblem. The lodge was named after Ancient Stirling Lodge of Scotland, which was chartered by David, King of Scots, in the year 1147, as an operative lodge, and whose history is traced by records. By Worshipful Edward P. Wells. It is very likely that no twenty-five year period in history has produced a greater change upon the everyday life of the individual than the quarter of a century through which we have just passed. Consider the difference between then and now in our mode of transportation, our methods of communication, our means of entertainment; add to that such stirring events as the World War, the granting of Woman Suffrage, the Prohibition Amendment and its Repeal, the Depression and the New Deal, and we realize something of the atmosphere of rapid transition which has surrounded The Lodge of Stirling in its inception and growth to the present time. In 1910 the City of Maiden was a growing and thriving community with a population of about 4.1,000. For several years it had been constantly increasing at the rate of about 1,000 each year. At that time there were two Masonic Lodges in the city, Mount Vernon and Converse, with a combined total membership of about 950. The average number of new members admitted each year to both Lodges was about 50. In 1927 the population of the city had increased to about 54,000 and the total membership of the three Lodges was over 2,200, an increase in population of 23 per cent, in the number of Masons of 133 per cent. It is plain from these figures that the foresight of our founders was sou nil; there was a need and a place for The Lodge of Stirling in Maiden Masonry. Exactly how and why the seed of thought which grew into the institution of our Lodge was first planted we must leave to our imagination and surmise. We do know, however, that the fertile soil which fostered that thought was the mind of one man in this community who was possessed of those qualifications of enterprise, courage, and ability which were needed to transpose the thought into actual fact. That man was Dr. Charles Edwin Prior. Dr. Prior was the Junior Steward in Mount Vernon Lodge. He was deeply interested in Masonry and was active in other branches of the Order. A capable physician and surgeon, he had a host of loyal friends throughout the community, and having determined that he would start a new Lodge, he set out to gather about him a corps of able followers. This was in the summer of 1910. The first recorded meeting of the Petitioners for a Charter of the new Lodge was held in Masonic Hall, on Wednesday evening, October 5, 1910. Forty-three Brethren, including one Past District Deputy Grand Master and six Past Masters, were in attendance. The principal business of that meeting was the selection of a Master to serve for the Dispensation period, and a name for the Lodge. In making their selection of a Master these Brethren concurred in a decision which was one of the most fortunate developments in our history. They chose a man whose vitality, enthusiasm, and commanding personality has been one of the factors in the success of those early years. This man was Worshipful Charles B. Burleigh, who at that time was a Past Master of Star of Bethlehem Lodge, of Chelsea. The question of a name gave rise to considerable discussion, during which it was suggested that "Bell Rock," "Mystic Valley," or "Rising Sun" would be appropriate. The name of "The Lodge of Stirling," which was the final choice, was probably suggested by Dr. Prior. He had become very friendly with the Brethren of Kilwinning Lodge, of Lowell, his son Everett being a member there; he was impressed with the characteristics of that Lodge, and hoped to pattern the one in Maiden along the same general lines. Kilwinning had taken its name from one of the three Ancient head Lodges of Scotland,— "Edinburgh," "Kilwinning," and "Stirling," and the desire to emulate Kilwinning of Lowell is very likely the reason for the name which our Lodge now bears. The second formal meeting of the Petitioners was on October 20, 1910. They voted to hold the regular meetings on the second Wednesday of each month excepting July and August, and elected George M. Weeks and Charles K. Prior to serve the new Lodge as Senior and Junior Wardens respectively. It is interesting to note that at this time Brother Weeks was serving in the same position at Converse Lodge which Brother Prior was rilling in Mount Vernon,— that of Junior Steward. A very important business of this second meeting was the appearance of these Petitioners before a joint meeting of committees from Mount Vernon and Converse Lodges which were charged with the duty of investigating the proposed new Lodge and recommending what action their respective Lodges should take in the matter. On November 30,1910, the Petitioners again met, and Brother Prior read the Dispensation which hail been issued that day and signed by Most Worshipful Dana J. Flanders, Grand Master, empowering those Brethren "to form and open a Lodge after the manner of Ancient Free and Accepted Masons." This, with the elected officers previously mentioned, was the first organization of our Lodge. They served during the year under Dispensation, except that Brother Cast, who had been appointed Senior Steward, decided not to take office. Consequently those officers below that station were moved up and Brother Ralph A. Stevens was appointed Inside Sentinel. With the formalities of establishing and instituting the Lodge concluded, the Brethren proceeded with the business of operating with vigor and enthusiasm, and in order to finance the enterprise it was voted to levy an assessment of $10.00 per member for the establishment of a working fund. At the first Regular Communication, on December 14, 1910, nineteen applications for the degrees were read and referred to committees. In order that there could be some work so that the Brethren might witness their Lodge in action, it had been arranged to receive a request from Simon W. Robinson Lodge, of Lexington, to confer the Entered Apprentice degree on one of their candidates. This was the first work of The Lodge of Stirling. At the second Regular Meeting, on January 11, 1911, a communication was read to the Lodge which today would bring joy to our hearts. It was a notice from the Maiden Masonic Association that the rent for the year Under Dispensation would be $400.00. A period of hectic activity followed this second Regular Meeting. There were Special Communications on the 20th, 25th, and 27th of that month; the third Regular was on February 8th, with Specials on the ]0th, 17th, 23rd, and 24th; and March was the same with five meetings. However, some one discovered a method of conserving a part of this energy, and we find that in May, at the sixth Regular Communication, Worshipful Brother Burleigh was presiding over a Lodge of Entered Apprentices with a skeleton organization in Masonic Hall, while at the same time Brother Weeks, Senior Warden, was working the Fellow Craft degree in Sodality Hall with the remainder of the officers. 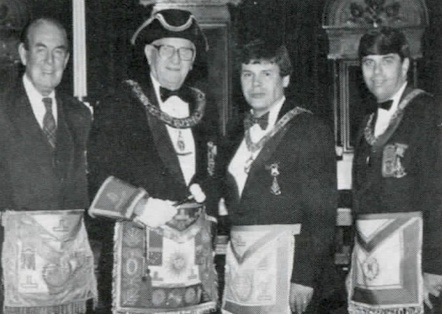 Later that evening they combined to raise four candidates to the Sublime Degree of Master Mason. At the 7th Regular Communication, on June 14, 1911, The Lodge of Stirling received a handsome compliment in the form of a fraternal visit by the Most Worshipful Grand Master, Dana J. Flanders. On September 13, 1911, at the Quarterly Communication of the Grand Lodge, the petition of The Lodge of Stirling for a Charter was granted, and this welcome news was announced at our regular meeting which was held that evening. The probationary period was concluded, and the establishment of The Lodge of Stirling as an integral part of Freemasonry in this Commonwealth was an established fact. The most spectacular and outstanding communication of our Lodge was the occasion of the Constitution on November 22, 1911. The festivities were opened with a supper for the officers of the Grand Lodge and the guests from Kilwinning Lodge, of Lowell, after which the Grand Lodge was opened in an anteroom and proceeded to the Lodge room under the charge of the Grand Marshal, Worshipful Harry P. Ballard. Included in this procession was the full organization of the Grand Lodge, with Most Worshipful Dana J. Flanders, Grand Master; District Deputy Grand Masters from the 3rd, 6th, 7th, 8th, and 11th Districts; Past Grand Master J. Albert Blake and eight Past Grand Wardens; also Most Worshipful Charles H. Wiggin, Grand Master of the State of New Hampshire. It is interesting to note here that Most Worshipful Brother Wiggin was at this time a resident of the City of Malden, and as Most Worshipful Brother Flanders also lived in Malden, it is perhaps the only case on record of two presiding Grand Masters living in the same city. In addition to the Grand Officers, there were seventeen Past and Presiding Masters present, and in the delegation from Kilwinning Lodge was the Presiding Master, three Past Masters, six officers, and three of the Brethren. The total number of Brethren present was 281, and of the Lodges presented there were 59 from Massachusetts, 5 from Maine, 2 from New Hampshire, I from New York, 1 from Nova Scotia, 1 from England, and 1 from Scotland. The Grand Lodge proceeded immediately with the ceremony of Constituting the Lodge, after which the Officers were installed by the Grand Lodge Officers, and the announcement was made that The Lodge of Stirling was duly organized. At the third Annual Communication, in 1913, the name of Right Worshipful Samuel Hauser, Past Senior Grand Warden, was added to the list; at the fourth Annual in 1914, Most Worshipful John Albert Blake; at the sixth Annual in 1916, Worshipful Donald M. Cameron, Past Master of Kilwinning Lodge, and Worshipful Henry Gerrish, Jr., Past Master of Mount Vernon Lodge, who had just completed his service of six years as the Treasurer of the Lodge of Stirling, and finally, in 1917, Right Worshipful Charles B. Burleigh. Only eleven names have been enrolled on this list, and no additions have been made since 1917. Two of our members have been honored by the Most Worshipful Grand Lodge as recipients of the Veteran's Medal. On December 22, 1929, Right Worshipful Charles S. Proctor, District Deputy for the Melrose 7th Masonic District, accompanied by seven officers and three Brethren of The Lodge of Stirling, went to the home of Brother Joseph O. Pearson who was that day celebrating his 82nd birthday. The District Deputy presented Brother Pearson with a Veteran's Medal, after which refreshments were served and a very pleasant fraternal visit was enjoyed. On June 8, 1932, at the 238th Regular Communication of the Lodge, Brother John Walter Pierce was conducted to the East, where Right Worshipful Lauren L. McMaster, District Deputy Grand Master, presented him with a Veteran's Medal. Worshipful Brother Burleigh, having served as Master of the Lodge through the very active and successful Dispensation period, positively refused to serve another year and was succeeded In George M. Weeks, who held the office for two years. Dr. Prior was installed as Master in December, 1913, and following him were S. Hale Baker in 1915, Philip S. Deane, in 1917; Erwin L. Pierce, in 1919, and Henry E. Guilford in 1921; all of these were among the original Petitioners. The first of our Brethren who had been raised in The Lodge of Stirling to attain the office of Master of the Lodge was Pitt R. Calkin. He was installed in 1923, and was followed in 1925 by Arthur W. Coombs. Worshipful Brother Coombs' administration was most unfortunate for him in that he was seriously ill at two different times during the years that he was Master, and in his second term he could work at only three of the meetings. In 1917 Elliott W. Aldrich, who had affiliated with the Lodge during the Dispensation period, was installed as Master, and succeeding him in 1929 was Charles E. Guilford. Worshipful Brother Guilford had observed the rapidly growing tendency in this jurisdiction toward a one-year term of office and, after considerable deliberation and conference with the other officers, decided to inaugurate that custom; since which time the following Brethren have been installed and served as Master for one term:— William C. G. Simkins in 1930, Edward P. Wells in 1931, A. J. GIossa in 1932, George W. Coombs in 1933, and Albin E. Berthel in 1934. The present incumbent, and the 17th Master of The Lodge of Stirling, Albert Brown, was installed September 11, 1935. Six Brethren have served the Lodge as Treasurer in these first twenty-five years: Worshipful Henry Gerrish, Jr., from the Institution in 1910 until he was succeeded in December, 1918, by Right Worshipful Brother Barron. Worshipful Philip S. Deane was installed to this office in December, 1919, followed in 1925 by Brother Albert Brown. In 1929, when Brother Brown accepted an appointment as Inside Sentinel, Worshipful Brother Aldrich took over the duties as Treasurer, which he performed until his death in 1932. Worshipful Edward P. Wells, the present Treasurer, was installed in September, 1932. John H. Studley, Jr., the first Secretary of our Lodge, held the office until his death in December, 1915. Since he had been re-elected at the Annual Meeting on November 30, 1915, a Dispensation was necessary to elect his successor. This was obtained, and on January 12, 1916, Worshipful Willis I. Foss, who was a Past Master of Converse Lodge and had been elected to Honorary Membership in The Lodge of Stirling, was elected as Secretary, installed that evening, and served for the balance of the year. At the next installation in 1916, Worshipful George M. Weeks took the office of Secretary, which he held until Worshipful S. Hale Baker was installed in 1920. In 1918 the members of the Lodge, recognizing the burden which they were imposing upon the Secretary, who had been serving up to that time without remuneration, at the Annual Meeting of that year voted to pay the Secretary $50.00 per year. This has since been revised to a per capita basis, but it is doubtful if any system can be found to properly compensate for the services to the Lodge of a good and faithful Secretary. Worshipful Brother Baker served only one year, and on November 30, 1921, our present Secretary, Brother Louis E. Dexter, was installed in that office which he has held continuously since that time. Previous to Brother Dexter's assumption of these duties the work of the Secretary had been well done, and the records properly kept, but the system of accounting and recording which he has placed in operation, coupled with his personal ability and enthusiastic interest, has brought to this office a high standard of excellence which it would be difficult indeed to surpass. The original Petition to form The Lodge of Stirling was signed by 58 Brethren, 53 of whom became members. At the first Annual Communication on November 29, 1911, which incidentally was the 27th Communication of the Lodge, we find the total membership had increased to 97. After this first year the growth of the Lodge seems to have been in four distinct stages: the eight-year period through 1919, when the increase was 145, an average of 18 per year; the five-year period through 1924, when the increase was also 145, but an average of 29 per year; the six year period through 1930, when our total membership reached 416, the highest it has ever been, which was only an increase of 33 for those six years; and finally the period from 1930 to the present time, when our total is 348, a decline of 68 from the peak. That rapid growth in the period from 1920 through 1924 was not peculiar to The Lodge of Stirling, but was even more pronounced in the other Maiden Lodges. The total membership of the three Lodges combined increased 50 per cent in that five-year period. Incidentally, it may be noted that that particular period from 1919 through 1924 is when the population of the city suddenly stopped its continuous and steady growth and tor those years remained at about 50,000. Several times in the earlier days of the Lodge the question of limiting the membership was raised. The first instance was in 1912, when the total membership was only 120, but because of the heavy operating expenses no agreement could be reached. In 1920, at the September meeting, Worshipful Brother Prior, who was considerably alarmed at the rapid growth then in progress, spoke on the subject and strongly recommended an amendment to the by-laws restricting the degree work to the Regular Communications. This advice, of course, went unheeded, as it did in all other Lodges. The by-laws of The Lodge of Stirling remain essentially as they were written in 1911 and approved by the Grand Lodge on September 13th of that year. Altogether, there have been twelve amendments. Four of these related to the Feast of St. Andrew, which was continually the subject of much controversy, until finally in 1932 all mention of it was removed by the by-laws. The Annual Communication on November 30th did not coincide with the fiscal period of the Grand Lodge. This required a contusing amount of detail in keeping the accounts, so in 1925 it was voted to change the Annual Communication to the Regular Communication date of the second Wednesday in September. In 19.32 the by-laws were amended to permit the election of officers at the Regular Communication in June, the intent of this action being to allow the new Master a preparatory period between his election and installation. The other amendments have been on the subject of fees and dues. At the meeting of November 30, 1910, it was voted that rhe fee for the degrees should be $40.00 and the dues $4.00 per year, these for the first year only. When the by-laws were first adopted in 1911, the fee for the degrees was set at $50.00, for membership $10.00, for life membership $60.00, and the dues at $4.00 per year. These rates remained in force until the annual meeting in 1921, when the by-laws were amended to the schedule of $60.00 for the degrees, $10.00 for membership, and $6.00 for dues. In 1930 the fees were again increased to $100.00 for the degrees, 525.00 for membership, and a sum equal to 25 times the annual dues for life membership. The dues remained the same at $6.00 per year. One subject which has been before the Brethren almost continuously for discussion is the question of rent. At the second Annual Communication in 1912 a cry was raised because the rental for that year had been fixed at $600.00, and the Master promptly filed a petition with the Masonic Association for a $200.00 abatement. This petition was denied, but the rent for the following year was reduced to $500.00, at which figure it remained for the next few years, but by 1922 it had increased to $K(X).00. In 1926, the lease expired on the Apartments at No. 76 Pleasant Street. The total expense of moving to the new apartments, about $15,000.00, was partially covered by contributions by the Brethren, but it took all of the surplus of the Association to make up the difference, and in 1928 our rent was again increased to S900, where it remained until 1934, when a 15 per cent reduction was obtained so that the present cost is $765.00 per year, which is nearly one-half of" the annual receipts for dues, — a fact which is sufficient explanation of why this is so vital a problem. In 1914 and 1915, during Worshipful Brother Prior's term of office, there were several meetings of the Lodge the circumstances of which it is well to note, particularly in these times when the Officers are experiencing so much difficulty in planning meetings which will be of interest to the Brethren. These were Special Communications, the entire purpose of which was to promote sociability; they were extremely informal, no work was done and the time was devoted to discussion and exchange of ideas concerning Masonry in general and the affairs of The Lodge of Stirling in particular. These meetings were very popular and well attended; they were either preceded by a supper or followed by an appetizing chowder and the sociability among the Brethren was unrestricted. The association in the early days between Kilwinning Lodge and The Lodge of Stirling was the occasion for a notable meeting on May 28, 1914. The Lodge was opened at an early hour and the Officers worked the first section of the Master Mason degree on five candidates, following which a delegation composed of 16 Officers and Past Masters of Kilwinning Lodge and seven other distinguished Masons from Lowell was received. Following the reception of these guests the lines were formed and the Brethren proceeded to the hall above where a fine banquet prepared by Brother Cubberley was served. Returning to the Lodge-room, the presence of the Grand Master, Most Worshipful Melvin M. Johnson, was announced and he was introduced after the usual reception. The Grand Master took this occasion to install Worshipful Harry G. Pollard, of Lowell, as the District Deputy Grand Master for the 12th Masonic District, after which the second and third sections of the Master Mason degree were completed with the Officers of Kilwinning Lodge and a number of the other distinguished guests assisting in the work. The sequel to this meeting occurred exactly one year later, on May 28, 1915, when about twenty officers and members of The Lodge of Stirling paid a fraternal visit to Kilwinning Lodge, where they were most cordially and hospitably entertained. Another communication of considerable interest in The Lodge of Stirling was on June 14, 1916, when Brother Charles M. Blodgett, who at that time was the Mayor of the City, was raised to the Sublime Degree of Master Mason. A delegation of twenty Past Masters, who were Mayors and ex-Mayors of various Massachusetts cities, were our guests at that meeting. They were headed by Worshipful Charles Bruce, Past Master of Palestine Lodge, of Everett, and an ex-Mayor of that city. They performed the entire work of the Third Degree on Brother Blodgett, a unique and impressive ceremony. Probably the shortest and smallest meeting which The Lodge of Stirling has ever held was the 44th Special on September 25, 1918, by Dispensation. The Lodge was opened at 6.00 o'clock, with seven Officers and three Brethren present; two applications for the degrees were balloted on, and the Lodge was closed at 6.25. On two memorable occasions The Lodge of Stirling has participated in joint communications with the other Maiden Lodges. On April 6, 1918, 185 Brethren, 71 each from Mount Vernon and Converse Lodges, and 43 from The Lodge of Stirling met to honor the Brethren serving with the Naval and Military forces of the United States. This meeting was presided over by Worshipful George A. Chisholm, Presiding Master of Mount Vernon Lodge, and the principal events on the program were the reading of the Roll of Honor bearing the names of 132 Brethren of the Maiden Masonic bodies then under arms, a prayer by Reverend Brother Richard E. Sykes, and stirring patriotic addresses by Right Worshipful Arthur D. Prince, Dist. Past Dep. Grand Master for the 12th Masonic District, and Worshipful Guy A. Ham, Gate of the Temple Lodge. As a fitting conclusion for this patriotic assembly, the Brethren stood and sang "America." In connection with this subject, we find from the Master's report in 1919, that 51 members, or about 22 per cent of the total membership of The Lodge of Stirling were attached to some branch of the military forces. Happy to relate, there were no casualties among them. On March 3, 1932, the Bicentenary of the birth of George Washington was fittingly celebrated by Maiden Masons in joint assembly. This meeting was under the direction of Right Worshipful Frederic L. Putnam, of Mount Vernon Lodge, and the principal speakers were Hon. Gaspar G. Bacon, President of the Massachusetts Senate, who spoke on the life and accomplishments of Washington, and Right Worshipful Frederick W. Hamilton, who told the Brethren of Washington's Masonic-career. The total attendance at this meeting was 273, 53 of whom were members of The Lodge of Stirling. It might have been natural if, during 1911, when The Lodge of Stirling was forging ahead so rapidly, some animosity on the part of the older Lodges had been felt. The record clearly indicates that this was not the case, but on the contrary "that noble contention of who best can work and best agree" prevailed, and at our first Regular Communication a letter from Mount Vernon Lodge was received extending to us the use of their regalia, of which generosity we were glad to avail ourselves; and at our meeting in May of that year we were visited by a delegation from Converse Lodge that presented to us the Three Great Lights which we still use and shall always cherish. The Brethren and Officers of the Lodge itself were equally generous. At the second Regular Communication, in January of 1911, Brother Roy Griffith presented a design which he had made for the Lodge notices with an engraving of Stirling Castle on the cover. This was accepted and used for a number of years. This same Brother later composed "The Song of the Craft o' Stirling" which was introduced at the Feast of St. Andrew in 1913 and was a regular part of that festival for several years. He also designed the Lapel Button which the Grand Lodge had permitted the members of The Lodge of Stirling to wear. Until quite recently, these buttons have been presented to all new members of the Lodge. At the Constitution of the Lodge, November 22, 1911, Worshipful Brother Burleigh announced that a beautiful gift of a silver Charity Plate had been made the Lodge by Brother Edwin S. Cotton. He then ordered the Marshal to place this plate on the altar, and that first contribution was the beginning of our present Charity Fund, and amounted to $62.50. At the first Annual Communication in 1911, a formal presentation was made of the following very practical gifts: Three Silver Grand Lodge Jewels by Worshipful Brother Charles B. Burleigh; Deacons' and Stewards' Rods by Brother George M. Weeks; Working Tools by Brother Charles E. Prior, Pedestals, Truncheons, and Gavel by Worshipful Brother Henry Gerrish, Jr., Books and Seal by Worshipful Brother John H. Studley, Jr. These are still in good condition and are put to constant use. In 1913, at the Annual Communication, Brother Frank A. Magee gave the Lodge a Freemason's Maul. It is patterned after the type of implement used by the early operative masons and is especially significant because it is made from wood that was taken from Stirling, Scotland. It was turned by Brother Newhook and marked with a silver plate by Brother Charles Cotton. In March, 1914, a picture of Stirling Castle was presented to the Lodge by Brother Joseph Levens. A very unique and valuable gift was presented on February II, 1925, by Brother Ernest B. Nash. It was a gavel which had been made from a piece of the Washington Elm in Cambridge under which General Washington took command of the American Forces in 1775. The presentation was in the form of an original poem by the donor. This gavel has been sent as a gift from The Lodge of Stirling to the museum of the George Washington Masonic National Memorial at Alexandria, Va.
Tonight we are celebrating the Feast of St. Andrew, a custom of our Lodge which had its beginning at the first Annual Communication. It was a coincidence that this Lodge which had adopted the name of one of the Ancient Lodges of Scotland should have received the Dispensation from the Grand Master dated November 30, 1910 and that they met on the evening of that same date and formed the Lodge. November 30th is the day that the people of Scotland observe the festival of Saint Andrew, the patron saint of that country, and the founders of our Lodge quickly recognized the connection. When our by-laws were first written it was provided that the annual communication should be held on November 30th, and that after the regular business the members should join in an annual feast. This provision was adhered to until 1932, when the economic conditions induced the members to strike out that clause and the celebration has been abandoned for the last three years. The little ceremony which we use in partaking of the regular Toasts was adopted from a similar but more elaborate one used by Kilwinning Lodge, of Lowell, which also celebrates this festival. Since 1919 only three regular toasts have been proposed,— "The Most Worshipful Grand Lodge," "The Lodge of Stirling," and "Our Departed Brethren," but previous to that there was no uniformity in the selection and at times as many as ten toasts were proposed. This Feast was always something of a burden financially, and in 1913 the by-laws were amended to require each Brother to contribute one dollar to help defray the expense, but in 1921 it was voted to strike out this provision. The original intention was that the Feast of St. Andrew should be a social gathering for the members of The Lodge of Stirling, with only a few distinguished Masons as invited guests. This idea was not strictly adhered to, but until 1927 the attendance was limited to Masons. On that year all precedents were broken, and some of the Brethren even felt that sacrilege was committed, when ladies were invited to attend the Feast. But, blasphemy or otherwise, the party was a huge success and was repeated the following year with a much larger attendance. In 1929 the celebration was conducted as an informal Ladies' Night; in 1930 it took the form of a Members' Night, and for the first and only time none of the Grand Lodge Officers or Presiding Masters of the District were present. This was the 20th anniversary of the Lodge and each member received a souvenir coin on which was shown the distinctive emblem of the Lodge and an inscription commemorative of the occasion. Incidentally, this 1930 Feast of St. Andrew was the last appearance in The Lodge of Stirling of Right Worshipful Charles B. Burleigh when he responded to the Toast "To the Most Worshipful Grand Lodge." That, my Brethren, is the story of The Lodge of Stirling at the quarter point of its first century; and while prophecy has no place in a record of historical events, I do not hesitate to predict that if we will strive to continue and protect the legacy which has been left us from these last twenty-five years,— if we will maintain the high standard of excellency in the work of the ritual, the real spirit of genuine good fellowship, with a hearty welcome to all visitors; a definite program carefully planned, for the business administration of the Lodge; and if we will follow the tenets of this great Order which teach us to believe in the Fatherhood of God and the Brotherhood of Man,— then the progress of The Lodge of Stirling must be onward and upward forever. By Wor. Francis S. Wells. On November 30, 1910, the Most Worshipful Grand Lodge of Massachusetts issued a dispensation empowering certain Brethren in the City of Maiden to form and open a Lodge after the manner of Ancient Free and Accepted Masons, said Lodge to be known as The Lodge of Stirling. On September 13, 1911, the Grand Lodge granted to those Brethren a charter, and The Lodge of Stirling became a full fledged part of Freemasonry in this Commonwealth. Needless to say, much groundwork had been done before this was accomplished. We have no record of the very early meetings which led to the formation of this Lodge, but we do know that on October 5, 1910, forty-three Brethren gathered in the Masonic Apartments for the purpose of choosing a name for the new Lodge and to elect a Master. In regard to choosing a name, there was much discussion; but, there being a strong Scotch influence among our Founders, it was finally decided to take the name of one of the three oldest Lodges in Scotland. Those three Lodges were Edinburgh, Kilwinning and Stirling. The name of Kilwinning had already been taken by a Lodge in Lowell; and of the two remaining, the lot fell on Stirling. In the choice of a Master, there was no question. Charles B. Burleigh, a Past Master of Star of Bethlehem Lodge of Chelsea, was chosen by unanimous vote. On October 20, 1910, a final organization meeting was held, at which time it was decided to hold meetings on the second Wednesday of each month except July and August. George M. Weeks was elected to the office of Senior Warden and Charles E. Prior to that of Junior Warden. Also at that meeting, the petitioners appeared before a joint meeting of committees from Mount Vernon and Converse Lodges which was charged with the duty of investigating the new Lodge and recommending what action their respective Lodges should take in regard to it. Of the three men already mentioned, some comment is in order. Charles E. Prior was, without doubt, the moving spirit in the founding of this Lodge. He was a physician with a host of friends and with the ability and enthusiasm to carry out a project of this kind. In some ways, George M. Weeks was his opposite, very quiet and retiring, but with a great capacity for hard detail work. The two complemented each other remarkably well. It is difficult for one who knew him well to speak of Charles B. Burleigh without going into superlatives. It is not really difficult to find a good ritualist. We quite often find a good administrator. Occasionally we run across a man with a warm, friendly disposition combined with enthusiasm. But when we find all of those qualities in one person, we have a rarity indeed. Such a man was Charles B. Burleigh. He did much to start The Lodge of Stirling off in a spirit of high ideals and friendliness, and we like to feel that his spirit still lives. "Hectic" is the only word to describe what happened during our ten months under dispensation. At the first regular meeting on December 14, 1910, nineteen applications for the degrees were received; and at the second regular meeting on January 11, 1911, the degree work really began. During that month, in addition to the regular meeting, specials were held on the 20th, 25th and 27th. The third regular meeting was on February 8, with specials on the 10th, 17th, 23rd and 24th; March was the same with one regular and four specials. In one seven-day period, three meetings and two rehearsals were held. The constitution of the Lodge on November 22, 1911, was a truly outstanding event. The evening opened with a supper for the officers of the Grand Lodge and our numerous invited guests, following which the Grand Lodge was opened in an ante-room and proceeded to the lodge-room under the charge of Wor. Harry P. Ballard, Grand Marshal. In that procession was the full organization of the Grand Lodge with Most Worshipful Dana J. Flanders, Grand Master, District Deputy Grand Masters from five Massachusetts Districts, Past Grand Master J. Albert Blake, and eight Past Grand Wardens, also the presiding Grand Master of the State of New Hampshire, Charles H. Wiggin, who, at that time was a resident of Maiden. In addition to the Grand Officers, there were present seventeen Past and Presiding Masters. The total number of Brethren present was 281, and of the Lodges represented, there were fifty-nine from Massachusetts, five from Maine, two from New Hampshire, one from New York, and one from Nova Scotia, one from England and one from Scotland. The ceremony of constitution was carried out in a most impressive manner; and the Brethren departed with every confidence of a bright and happy future for The Lodge of Stirling. Some time before the formation of this Lodge, Dr. Prior became very friendly with the officers and members of Kilwinning Lodge of Lowell, and during his numerous visits to that Lodge, he was very much impressed with certain special customs practiced by them, particularly the celebration of the Feast of Saint Andrew, the Patron Saint of Scotland ; and a very similar, although simpler, ceremony was adopted by the Lodge of Stirling. Although with the passing of the years the details have changed somewhat, in essence the form of the Feast has always been the same': a very short Masonic meeting, a dinner followed by toasts to the Most Worshipful Grand Lodge of Massachusetts, to The Lodge of Stirling, and to our departed Brethren, and closing with either an evening of conviviality and good fellowship or more degree work. It was first celebrated at our first annual meeting and continued each year until 1932, when reasons of economy made its continuance inadvisable. It was revived in 1935 and has been an annual feature since then. The next event of particular interest came on December 4, 1936. This was a combination of our 399th communication, the Feast of Saint Andrew, and the celebration of our twenty-fifth birthday. At an afternoon session, the Most Worshipful Grand Master, Claude L. Allen, accompanied by his Grand Marshal and a Suite of Distinguished Masons, honored the Lodge by paying it a fraternal visit, occupying the East, and complimenting the Lodge most highly on its quarter century of progress. Following an excellent dinner, the Brethren participated in the Regular Toasts, the response to the first toast (The Most Worshipful Grand Lodge) being given by the Grand Master, that to the second toast (The Lodge of Stirling) by Worshipful Edward P. Wells, who read a most interesting history of the Lodge, and that to the third toast (Our Departed Brethren) by Right Worshipful Frederic L. Putnam, who spoke most feelingly of his many close friends who had gone before. While at the tables, a cable was read which said "Fraternal Greetings—-Ancient Stirling", a most pleasing gesture from the Scotch Lodge whose name we had taken. There were present at the dinner 198, consisting of 107 members of the Lodge of Stirling, 10 members of the Grand Lodge Suite, and 81 visitors. Much favorable comment was heard of the smoothness with which the events of the afternoon and evening ran off, and much credit for that is doubtless due to the organizing ability of Wor. Albert Brown, the Presiding Master at that time. The growth of the Lodge in numbers has never been spectacular, but has followed quite closely the growth of the other Lodges in this vicinity. We started with 53 members, which increased to 97 during the period of dispensation. From then until 1925 the increase of numbers was very even, with an average of about twenty-two per year. From 1925 until 1932 we continued to grow-but at the greatly reduced rate of about five per year, bringing our membership to 416. At that time the depression began to show its serious side and our membership dropped sharply until 1940, when it was down to 286. Then it again turned upward, and we now have a membership of approximately 500. Since the founding of the Lodge, sixty-nine of our members have served in line offices, that is, offices from which if they had continued to serve and advance they would eventually have become Master. Of those, only 42 have actually been seated in the East; 8 are in process of approaching that honor; and 19 have dropped out. It is also interesting to note that of our 42 Masters, only 12 had been installed in every line office. In regard to the length of service in the permanent offices, we have been most fortunate, particularly in the office of Secretary. Louis E. Dexter held that office from 1922 to 1942, a total of 21 years, and brought to it a degree of efficiency rarely equalled and never excelled. On his retirement, that position was taken over by Wor. George W. Coombs, who has carried out the traditions of the office nobly. He is now serving his 19th year. Three of our Past Masters have been honored by being appointed to the office of District Deputy Grand Master: R. W. Charles B. Burleigh, R. W. Edward P. Wells, and R. W. Albert Brown, all of whom served with honor. Five of our members have received the fifty-year Veterans' Medals: Whitney S. Pierson, John W. Pierce, Shirley R. Mitchell, Theodore Burleigh, and Francis S. Wells. The Service Committee is sometimes referred to as the backbone of the Lodge. To the casual observer its members are white-clad waiters who serve the food at our dinners; but their real usefulness goes much deeper. Their really important function is as a ready and quick means of communication between the Master and the members of the Lodge as a whole. Their efficiency in this shows in many ways. Possibly the most noticeable one is in the attendance at Masonic funerals. Through the committee word of such affairs is passed to our members quickly and as a result our attendance at such funerals has increased many-fold. The committee in its present form came into being during the administration of Wor. Albert Brown, and for the first ten years of its existence, Wor. Albin B. Berthel served as General Chairman and Wor. George W. Coombs as Secretary. An outstanding feature of that period was the organization of the Stirling Players. Under the direction of Wor. Bro. Coombs, several Masonic plays were rehearsed and produced. Altogether forty-seven performances were given in Masonic bodies throughout the eastern part of the State, thus spreading the fame of the Lodge of Stirling. At each appearance donations were accepted and the money turned over to some worthy charity, in nearly all cases, through the Grand Lodge. About twenty-five years ago, either as an individual Lodge or in company with other Lodges in the district, pilgrimages were made to the Masonic Home and Hospital. It is regrettable that the custom has ceased, for when practiced, it gave the members a wonderful opportunity to see what the Fraternity is doing for our aged and infirm and under what delightful surroundings. Our first Past Masters' Night was held in May of 1936 and with a few exceptions has been held annually ever since. In 1952 there was added to the usual work of the evening a special ceremony in which the Past and Presiding Officers meet on the floor and do reverence to the memory of the Past Officers who have died. Our Christmas parties started in 1939, have been repeated every year since then, and are a delight to young and old. On numerous occasions we have played host to the DeMolay Boys and the Rainbow Girls, and always with the greatest pleasure to us. Each month we celebrate the "Masonic birthday" of the Brothers who became members of the Lodge in the same month in years past. As each member's name is called, he approaches the East, is presented a flower and is given a greeting by the Master. This little ceremony is a real delight, giving as it does a warm personal touch to our meetings. The regular meeting of June 1940 was one which made a deep and lasting impression on those who attended it. At that meeting Frederick W. Berthel, Jr., received the Master Mason Degree. Present in the lodge-room was his father, Frederick W. Berthel, Sr. Four of his uncles, Charles F. Berthel, Joseph S. Berthel, Albin B. Berthel and Harold H. Berthel, took part in the work, and at its conclusion, a most beautiful and instructive charge was given by his grandfather, Albin Berthel. It was indeed impressive to see those seven men, all Berthels and all members of The Lodge of Stirling, gathered about the East. Elliott W. Aldrich was Master of this Lodge from 1927 to 1929. He died August 9, 1932, leaving a will, under the terms of which the estate was set up as a trust fund, the income of which to be used for the support of his widow and sister and, after their death and the payment of certain specified bequests, the residue to go to The Lodge of Stirling and to be held by it until, by investment, it had grown to a certain specified amount, after which the income to be used for the benefit of all the members of the Lodge. The original executors of the will were three members of this Lodge: Albert Brown, Pitt R. Calkin, and Edward P. Wells. It being a self-perpetuating group, on the death of Bro. Calkin his place was taken by Horace F. Lind. Their task was not an easy one. At the time the will was written, the estate was fairly substantial; but the crash of 1929 reduced it to a point where it was only by the greatest care in the handling of investments that Mrs. Aldrich and the sister could be cared for properly. After the death of Mrs. Aldrich and the sister, the residue of the principal passed to The Lodge of Stirling and is now held by it under the name of The Elliott W. Aldrich Fund, and is administered by a board of three members of the Lodge who are the same men who served as executors under the will. Special attention has been given to this item as a shining example of the affection one man felt for Freemasonry in general and for The Lodge of Stirling in particular. Our by-laws state that the trustees may accept contributions to this fund. Already some contributions or pledges have been received, and it is to be hoped that others will follow with either immediate donations or by remembering, in their wills, this work so nobly started by Brother Aldrich. Looking back over those fifty years, we see a good picture. It is true that we have had our troubles. The depression period, of which mention has been made, was indeed trying: month after month with no applications for either the degrees or membership; a dropping off of the attendance at meetings; financial worries and the realization that some of our members were in real distress. All combined to make the days gloomy. Fortunately, the spirit of our leaders never wavered. We held our heads high and passed on into the more favorable period with everything well under control. Today our financial condition is excellent; our growth in numbers is satisfactory; the attendance at our meetings is very good. Above all, we have kept the faith in maintaining that spirit of friendliness so strongly taught by our founders, and we have every reason to expect that the future will be as bright as the past. Wor. Stanley N. Dickinson, chairman of the 75th Anniversary celebration of the Lodge of Stirling, Malden, had the Lodge participating in a number of special events during the month of November, including the annual Feast of Saint Andrew and a concluding celebration with a dinner and ball at Revlin Plaza, Maiden. Officers of Ancient Sterling No. 30, Scotland and The Lodge of Stirling, Malden. "A dream come true, everyone worked so hard and so long to make this possible," said the Right Worshipful Master of Lodge Ancient Stirling #30. on the roll of the Grand Lodge of Scotland as he and Wor. Steven Graffam stood in the East of the Lodge of Stirling in Maiden. Dressed in Tartan and full regalia of their mother Lodge, dating back to somewhere before the year 1599, Officer Bearers of Lodge Ancient Stirling #30 paid a visit to its sister Lodge in Malden for a week. They worked the Three Ancient Scottish Degrees for the Brethren to witness. The three Degrees were presented over two consecutive nights with over a hundred Brethren on the sidelines for each evening. The Brethren from Scotland were Past Masters and Regular Office Bearers from Ancient Stirling #30. as well as from five other Scottish Lodges who asked to join in to fill every station. The Brethren in attendance appreciated the dedication and study it must have taken to do such fine work, as the ritual of the Office Bearers of Ancient Stirling was superb. During their free time, the Brethren and Ladies went to such sights as Boston, Rockport, North Shore Music Circus, The Spirit of Boston Dinner Cruise, and the Grand Master's Country Fair. It was a wonderful time to get to know the Brethren and Ladies that had traveled from Scotland and many lasting friendships were forged. This venture all started back in 1987 when some of the Brethren from Malden visited Stirling. Scotland and asked one of the local Scots if there was a Masonic Lodge in town. The rest has been written into the history of the two Lodges over the past seven years. 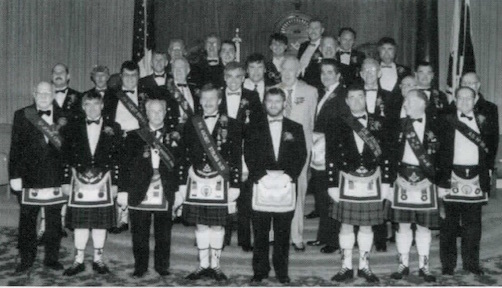 Many trips were made by small groups of the Brethren from both Stirling Lodges back and forth, but this was the first time that dispensation had been mutually granted for a Scottish Lodge to travel to Massachusetts for the purpose of "putting on the Degrees" with an entire line of officers. At the installation of officers, Wor. Paul Sandoe was installed as Master and presentations were exchanged between the two Lodges. The D. D. G. M. of the Melrose 7th Masonic District, R. W. Paul Watts, was present on one of the evenings and also made two presentations on behalf of Grand Lodge. The first presentation was that of a 50-year Veteran's medal made to Wor. Stanley N. Dickson (Master of The Lodge of Stirling 1952-53). Wor. Stanley, known throughout the District as well as at Grand Lodge, was present with his wife, Lillian. It was indeed a pleasure for all in attendance to see "Wor. Stanley" receive this recognition. The next presentation was deemed "the best kept secret in the Lodge" by its recipient. R. W. Paul Watts had the honor of presenting the coveted Joseph Warren Medal for distinguished service to Wor. 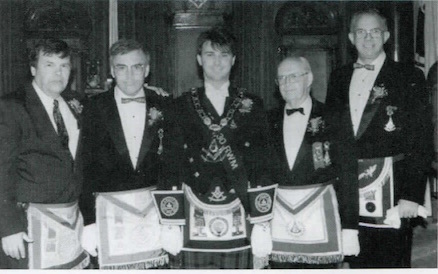 John Girdvainis, Master of the Lodge of Stirling 1984-85. Wor. Bro. Girdvainis has been "a pillar of Freemasonry" since he came into the Fraternity. Serving as the Senior Warden for the upcoming year, he also Chairs many of the committees of the Lodge. In addition to this, he serves as a trustee to the Maiden Masonic Association. He is a Member of the Minute-men of Aleppo Temple, a Past High Priest of the Royal Arch Chapter of the Tabernacle. He is also the presiding District Deputy Grand High Priest of the 27th Capitular District, a loving father and husband. This honor presented to Wor. Girdvainis was shared by all the Brethren who have come to know him in Lodge. On this night every member of the Lodge of Stirling was exceptionally proud. With all the work of the evening completed the Brethren and Ladies headed to the Banquet Hall for dinner and dancing. Wor. Mike Prodanas, Wor. Charles Horton, Rt. Wor. Paul Smith, Rt. Wor. Parker Williams, Wor. Richard Perry. This is not the end of the story; many good memories were etched into the minds of the Brethren and Ladies from both of the Lodges. A group from The Lodge of Stirling is hoping to go to Scotland this November to be with Wor. Paul Smith when he steps down as Master of his Lodge. Members of The Lodge of Stirling have also been asked to assemble a line of Officers to be received in Ancient Stirling #30 for the purpose of "putting on the degrees" for our Brethren in Scotland. This page was last modified on 2 June 2017, at 09:42.